The windows in Little Flower church were designed and manufactured by Rault Freres, of Rennes, France, and installed by Burns Hanley Co. Ltd. of Regina. 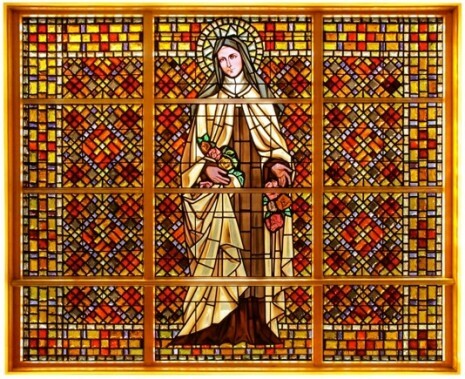 It is interesting to note that, with the exception of the main window of St. Thérèse, the themes of the windows are based upon the Litany of the Holy Name of Jesus and the Loreto Litany of the Blessed Virgin Mary. The Church’s formal prayers, many based upon Litanies, were common practice until the time of major reforms resulting from the Second Vatican Council in 1964. It is through the simple and beautiful language of symbols that the outward and visible form reveals the inward and invisible reality that moves and directs the soul of a person. Christian symbolism expresses the universality of this unspoken language. In this manner divine truth is recognized and a deeper insight is given to a person's ability to understand God's presence in all creation. Thérèse Martin entered a Carmelite convent at age fifteen. As Sister Thérèse of the Child Jesus, she lived a hidden life. She was just twenty-four when she died of TB. The world came to know her through her autobiography, The Story of a Soul. She described her life as “a little way of spiritual childhood.” She lived each day with unshakable confidence in God’s love. What matters in life is “not great deeds, but great love.” “My mission — to make God loved — will begin after my death,” she said. “I will spend my heaven doing good on earth. I will let fall a shower of roses.” This is the reason St.Thérèse’s emblem is a crucifix covered with a profusion of roses. The celebration of her Feast Day is October 1.